Welcome to 903 Torrey Pines! Situated on a large elevated corner lot, this home is neat as a pin inside and out and is ready for its' new, proud owner. The floor plan is open with the kitchen overlooking the dining area and living room and beyond to the backyard. There have been several improvements during the recently completed remodel, including granite counters and glass tile backsplash in the kitchen, hardwood laminate floors, high end cabinet pulls, solid surface counters both bathrooms and a new vanity in the master bathroom, updated lighting fixtures and more. The master bedroom is nicely sized with a large walk-in closet and the master bath enjoys oil rubbed bronze hardware and fixtures and a lovely tiled shower with waterfall glass door and hardwood laminate floors. The hall bath has also been upgraded with solid surface counters, new fixtures in oil rubbed bronze and new waterfall glass bypass doors. Natural light floods the home from the many windows that offer nice views of the manicured yards consisting of mature shrubs, bushes and trees and a nie lawn that is fenced for privacy. The front yard is eco-friendly and drought tolerant for a small water bill and you're just steps to hiking trails, golf, and public transportation. This home has been well taken care of by the owners and it shows, truly a turn-key property. 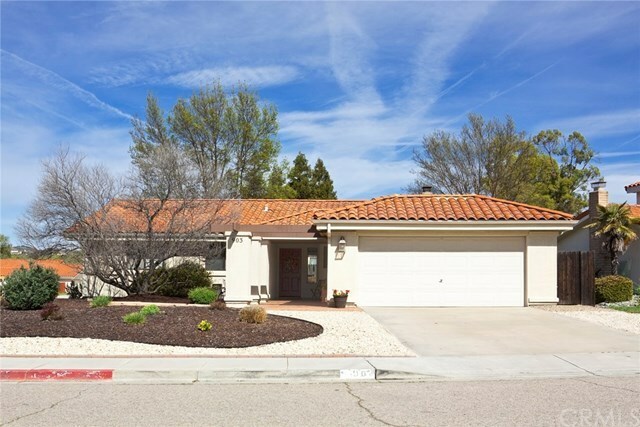 So, if you're looking for a home that you can just move your furniture into and start enjoying the Paso Robles lifestyle, this could be just for you.